"The Polar Express" is the most expensive vanity project ever made. Fashioned out of a computerized concept, with a budget that reportedly extends into the area of $170 million, Robert Zemeckis's flashy and ambitious motion-capture holiday cartoon is so intoxicated by its own wild production values that it has little time to do anything else - not the least of which is tell a halfway-compelling story, even by the average child's standards. And that's a little disheartening, because the picture and all its positive energy arrives at a very convenient time, when the world around us in utter turmoil and there is such a strong desire for something genuinely uplifting. For those a little more intuitive than most young kids, however, it's hard to find much to celebrate in a film that seems less like a good-hearted fable and more like a successful business man waving around his bulky check book. The movie is based on a famous children's book by Chris Van Allsburg, which is highly regarded, I guess, just because it's one of those stories in which the heroes are preoccupied with the notion that Santa Claus may or may not be real. The narrative doesn't even bother to give its characters names or proper introductions; rather, it refers to them by informal descriptions like "Lonely Boy" or "Hero Girl," and spends the rest of its time allowing all sorts of misadventure to transpire between them. At the opening of the film, "Hero Boy" (one of many characters voiced by Tom Hanks) is lying in bed waiting for the sound of Santa's sleigh to reach his ears, hoping that his suspicion that the big burly guy may not exist will be proven wrong. He is at that age, naturally, when children begin to be cynics about the Holidays, and the boy is certainly no different from they way you or I was at that time of life. Unlike us, however, this young lad's pessimism makes him one of the inevitable targets of the Polar Express, a steam locomotive that passes into ordinary streets on Christmas Eve and collects all the non-believing children for a trip to the North Pole. At the helm of this excursion into the arctic is the Conductor (once again, Hanks), an eccentric and perplexing individual who always seems to know what his train's passengers are thinking and doing. He knows that kids like the hero are going to be skeptical about hopping aboard an engine they never saw before, but he also knows that a kid's curiosity will make him cave, especially when the train begins moving without him or her on board. He also knows that each child is there for their own specific reason, too, a fact that is underscored by a plot gimmick in which he hole-punches their train tickets so they spell out an important word to each. I suppose the aura of being an adventure that takes place on a locomotive makes the whole ticket metaphor significant, but the movie tends to sweep it under the rug, really. What it does not do, at least, is forget that all kids need friends, especially when they are on mystifying journeys like these. The hero finds his acquaintances in two Polar Express passengers: one, a sweet and good-natured girl who seems to care more about others than herself, and the other, a lonely kid from the rural country who, at one point of the film, laments in song about how he has never been visited by Santa Clause (or even had a realistic Christmas, we gather). The irony here is that the lonely kid is the most sympathetic of the children, but the plot chooses to make its narrative center out of someone who is just your standard skeptic. Haven't we seen movies about these types of kids before, though? The story of non-believing children and the spirit of Christmas is one in which the primary moral has played out in an excessive manner in the cinema. It's old. For a movie so concerned about the technical benchmark, you'd expect it to choose a story with a little more poignancy and a little less formula. But it's all just routine from beginning to end; the hero remains pessimistic even when the Polar Express halts in the North Pole, and only begins believing when the big old guy in the red suit actually walks out to him. Been there, done that - a million different times. In regards to positives, "The Polar Express" at least has a few bonuses here and there. I enjoyed in particular one narrative device in which Santa's sleigh bells can only be heard when the person listening is a believer of his existence; otherwise, they sound as if they are dead (and the movie demonstrates this effectively in the progression of the hero's skepticism). 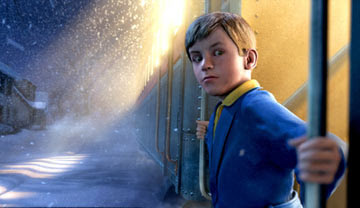 The film also has a couple of bright spots in terms of adventure, like when the Polar Express veers off course and winds up stuck on a frozen lake, or when the three heroes get sidetracked in the North Pole and wind up visiting various elf workshops before getting trapped in Santa's big bag of presents. And in regards to the supporting characters, the picture manages to create an ensemble that, despite being written in broad strokes, is amusing on several levels. A kid who thinks he knows everything provides some tolerable comic relief at certain parts, and a train hobo (Hanks yet again) who offers advice and then assists the hero is both engaging and mysterious (and not just because he seems to dissipate into thin air with the snowfall). Visually, the movie has fantastic ideas but is too burdened by the consequences of its technique for them to leave any lasting impression. 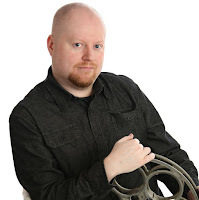 Critics will no doubt tout that the motion capture technique, in which an actor's live performance serves as the foundation for an animated character, gives "Express" a look that is unlike any other film ever made. But I would argue that fervently - for one, the film's thrust has an essence that suggests it was concocted as yet another elaborate scheme to make digital effects look like genuine reality, and secondly, many are inclined to forget about "Final Fantasy: The Spirits Within," an all-digital sci-fi adventure from a few years back which bears a striking resemblance to this current endeavor (and, in ways, was also more convincing in terms of style). New technique or not, the look of this picture is fueled by the central notion that you are gawking at sights you have never seen at the movies before. For a holiday picture, perhaps. But for a CGI-rendered endeavor? Get real. Good technique and plausible delivery could easily excuse even the most conventional of stories, but "The Polar Express" is simply too uneven for its own good; the attractive palette is undermined by the overzealousness of the visual, and the detail levels seem such a drastic departure from the simplicity of the narrative that you feel like you're stuck in the middle of a disproportionate balance beam. It's a very unpleasant contrast. Having said that, is a person of my age even in the target audience of this flick? Hardly. At its very basic core, the movie is strictly intended for tots, and the CGI is basically there to act as an added bonus (or to at least keep the adults from falling asleep). But the minute that someone gets past the charming façade of this thing is the minute when the film's true essence is exposed. The movie is lazy on a substance scale and too rowdy on a technical one and the fact that it required such an exorbitant amount of cash to pull the endeavor off is rather telling. One would have thought, at the very least, that part of the $170 million budget could have either gone into hiring a good screenwriter or finding source material that equaled the visual instead of making it look so lopsided.